Rinpoche traveled to the United States in 1979. The combination of his warm personality, his depth of knowledge, and his meditative realization magnetized thousands of students. His tireless teachings led him to Europe, Russia, Korea, Hong Kong, Australia, and South America. He resettled in Brazil in 1995 after successfully establishing numerous centers and meditation groups in the United States and other places. In order to maintain his lineage teachings, he ordained a number of his Western students as teachers and gave them specific authorizations to teach. Since Rinpoche's Parinirvana on November 17, 2002, the extensive Brazilian network of centers—many with their own resident lamas—and meditation groups have been under the spiritual direction of Chagdud Khadro, Rinpoche's wife, whom he ordained as a lama in 1997. Rinpoche’s work is maintained by Chagdud Gonpa Foundation in North America, by Chagdud Gonpa Brasil, and by Chagdud Gonpa Hispanoamerica in Spanish-speaking Latin America. The Mahakaruna Foundation administers support for Chagdud Gonpa and associated monasteries in Tibet and Nepal. At the time of her ordination as a lama in 1997, Rinpoche invested her as the future Spiritual Director of Chagdud Gonpa Brasil. Since Rinpoche's Parinirvana in 2002, she has focused on maintaining the high caliber of Vajrayana training he had established. During her time with Rinpoche, Khadro received constant training from him both in organizing dharma activities and in the teachings and practice of Vajrayana. She was among the collaborators for his autobiography Lord of the Dance and with his guidance, she compiled commentaries of his teachings on the Dudjom Tersar Ngondro, the Longsal Nyingpo Phowa, and the concise version of Apong Terton's Red Tara. Formerly the managing editor of Padma Publishing in the United States, Khadro has edited many translations of Tibetan works. Today Chagdud Khadro is tireless in cultivating the seeds planted by H.E. Chagdud Tulku Rinpoche: the construction of Padmasambhava’s Pureland, translation and publishing of texts in Portuguese and Spanish, projects related to education and to death and dying. 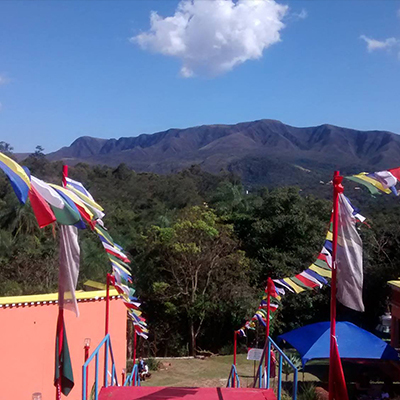 Khadro supervises the activities and teaches in all the Chagdud Gonpa Brasil centers and Chagdud Gonpa Hispanoamérica. She also teaches in Europe, United States and Australia. Born in the US, Lama Tsering has served H.E.Chagdud Tulku Rinpoche as his translator for more than 11 years. After completing a three year retreat in 1995, she was ordained as a lama and recognized by Rinpoche as a holder of the Red Tara lineage, authorized to give teachings and empowerments. In the same year she was invited to teach in Brazil where she moved to shortly after. Her warm and humorous style reflects Rinpoche's own humor and empathy, with focus on cultivating compassion, training the mind, and applying the dharma in daily life. She teaches and conducts retreats in many cities across Brazil, Chile, New Zealand and Australia as well as returning each year to fulfill the requests of her students in North America. Lama Tsering is the resident lama and director of Chagdud Gonpa Odsal Ling in São Paulo and is currently coordinating the construction of Odsal Ling's temple in Cotia along with her husband Lama Padma Norbu. Born in Denver, U.S.A. in 1948, Lama Norbu (David Everest) was educated and worked as an electrical engineer during his early years. He met his teacher, H.E. Chagdud Tulku Rinpoche in 1980 and, after completing the cycle of Dzogchen teachings and retreats, was ordained a lama in the Vajrayana tradition in 1995. For twenty years he worked with his teacher to carry out various projects such as the construction of retreat centers and the Khadro Ling temple in Southern Brazil. He later completed a solitary two year retreat under Rinpoche's guidance, and was encouraged to give teachings and share his experience in integrating Buddhist principles with the challenges of daily life. He and his wife, Lama Tsering Everest, currently live in São Paulo, Brazil, where he divides his time between the construction of the Odsal Ling Temple, various children's projects, and teaching. She is a resident lama of Khadro Ling, and travels throughout Brazil supporting practitioners through teaching, spiritual counseling, and practice. She is also an extraordinary lama dancer who authentically expresses the meaning of meditation through movement. Lama Yeshe has been a student of H.E. Chagdud Tulku Rinpoche’s since 1990. 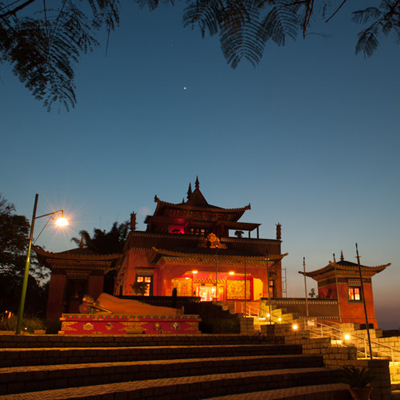 After meeting Rinpoche in Brazil, she traveled to Rigdzin Ling in California, where she participated in several important retreats and quickly mastered excellent English. She returned to Brazil with Rinpoche in late 1994, serving as a translator to both Rinpoche and Chagdud Khadro. During this time in Brazil she also became a fine performer of the traditional sacred dances of Vajrayana Buddhism. Lama Rigdzin has been a student of H.E. 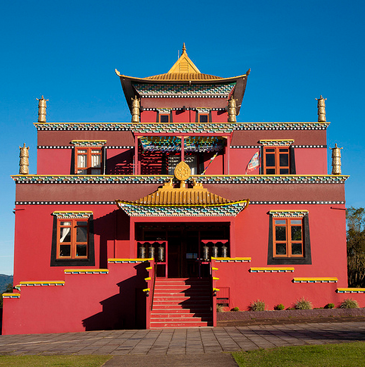 Chagdud Tulku Rinpoche’s since 1992, first at Rigdzin Ling, in California, then, since 1995, in Brazil. During that time he has attended many teachings and retreats, and served Rinpoche in various capacities. His construction and craftsman abilities were extremely valuable during the construction of the temple at Khadro Ling, and as a fine artist, he has worked with Rinpoche on artistic projects, most notably a large statue of Akshobhya Buddha. He has also served as chöpon (shrine master), umze (chant master), lama dancer, and as Rinpoche’s translator. His qualities were officially recognized by Rinpoche in an ordination as lama in 2002.